Cloudberry represents the spirit of fun and artistic mischief. Whatever she does looks like the greatest fun, and whenever she rests, no one looks more relaxed. Occasionally she combines all these aspects simultaneously. 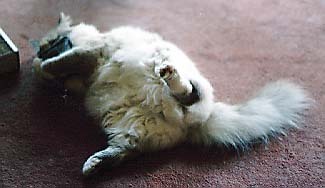 Cloud in typical abandon with catnip toy. How she started life is anyone's guess, but she was abandoned in a box in front of a pet shop. 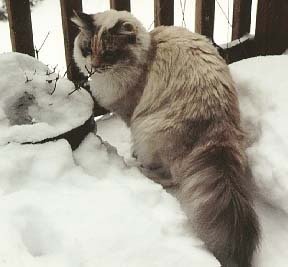 (Subsequently, as she becomes older and her color develops, in all probability she is a Birman, probably a lynx point of one kind or another.) Although she was well taken care of there and made friends with other animals, Cloud didn't trust people--but she loved boxes. At the time Sue and I were looking for a friend for Muffin, and Cloudberry (age approximately 1 year maybe) seemed to have an interesting spirit: In spite of being 99 percent asleep, she was slowly playing with a chain hanging just outside her cage. The introduction of the two cats, Muffin and Cloudberry, went very smoothly. Muffin ran and hid under the sofa in the living room, and Cloud ran and huddled on a corner of Sue's desk. With brief exceptions Cloudberry stayed at her corner for three days, and then she began her explores. display her full coat or colors. On the fifth day of Cloudberry's arrival, during evening play (a somewhat unfortunate event instituted by Sue), Muffin rolled her favorite ball to Cloud. Cloud sniffed the ball; Muffin and Cloudberry sniffed noses; and they became fast friends if not litter mates by intent. The two are always close to one another unless Muffin is really worn out, and Cloud has to call and call or attack an interesting box to draw Muffin out. On the first occasion that Sue tried to pick up Cloudberry, Cloud growled. And there are growls and there are growls. Cloudberry's is something like the cave lion who just spent the season in hiberation and is ready to rip anything apart that approaches within paw's reach. If the source of the problem isn't removed immediately, then her growl really gets fierce. Thus, there was no picking up Cloud unless really necessary; nor was she overly partial to being combed. But then she has miracle fur: it never gets dirty and it never mats. Cloud enjoys snow, rain, whatever, with no ill-effect. In spite of what I've just written, one day Cloudberry decided to teach me how to carry her. It began as a game: She would jump onto a scratching post to catch a pipe cleaner--and then would fall off the post. I had to catch her or watch her fall to the floor. Once caught, Cloud would proceed to stay in my arms while playing with the pipe cleaner. Of course, after a while even I guessed that she was falling on purpose. For a time I could carry her from one room to another if I first gave her a pipe cleaner to hold. 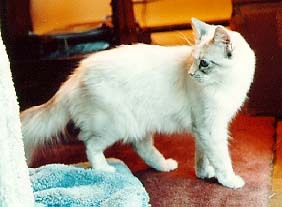 These days, however, Cloud's the most relaxed and gentlest of cats to transport--and she expects it. Nighttime is not nighttime unless she is fetched to the bedroom. Cloudberry also has a blood-curdling shriek if I should happen to forget. For the longest time I considered Cloudberry something of a flibbertigibbet, but after reading the book Why Cats Paint, I came to realize that there was a lot more to Cloudberry than I ever suspected. As it is, Cloud's motto seems to be Live It Now! And she always does. Ever see a cat stand? A life worth living is worth eating. Receiving is fine but taking is better.